Step #2: Lay in a Supply Snow and ice can strike areas as far south as the Sunshine State, according to experts at the University of Florida. Even a mild winter storm can cause power outages and strand people inside their home for days. So stock up on emergency supplies like extra firewood, packaged foods, flashlights, extra batteries, and a weather radio. Have a plan in place for a power outage so everyone knows what to do. Step #3: Wrap Your Pipes Few wintertime problems are more catastrophic than burst pipes. Imagine your basement or crawl space turning into a swimming pool while the weather outside is well below freezing. The best way to fix this problem is to prevent it from happening in the first place. So wrap your pipes, seal off your cellar from the wind, and leave a trickle of water running on especially cold evenings. Check out this fall-maintenance checklist from Angie’s List for more details. Step #4: Watch Out For Poison Gas Accidental carbon monoxide poisoning kills more than 400 people each year, according to the National Safety Council. Even moderate exposure to this toxin can cause permanent brain damage in children and adults. So invest in a carbon monoxide detector for your home. If you already own a detector, then check it each autumn to ensure proper functioning. Add fresh backup batteries as well. Step outside right away if you notice symptoms like nausea, dizziness, and headaches. These are all warning signs that carbon monoxide is loose in your house. Step #5: Use Space Heaters With Care Space heaters can provide added comfort in the winter, especially in parts of your home that ducted heat can’t reach. But these handy products can turn lethal if used without care. Keep your heaters away from curtains or other flammable materials. Move them away from walls and make sure kids or pets never play around them. Only use space heaters that have a UL safety rating. Dispose of any heater that creates sparks or smoke. 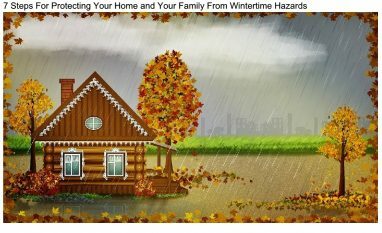 Step #6: Prepare the Outside of Your Home Winter weather can wreak havoc with your home’s exterior unless you take precautions against the cold. Have a supply of rock salt or a similar product within easy reach to keep your walkways ice-free. Seal gaps around your chimney, foundation walls, and any other place where cold air might seep in. Use care when setting up holiday displays. Use a roof rake to clear obstructions that could lead to ice dams and other hazards. Step #7: In the End, Relax Winter evokes thoughts of holiday cheer, snowy scenery, and nights cuddled up in a cozy blanket with a cup of cocoa. Using the tips in this post can help you to enjoy the season’s delights while keeping you and your loved ones safe. So put another log on the fire, kick off your shoes, and make the most of this marvelous time of year.